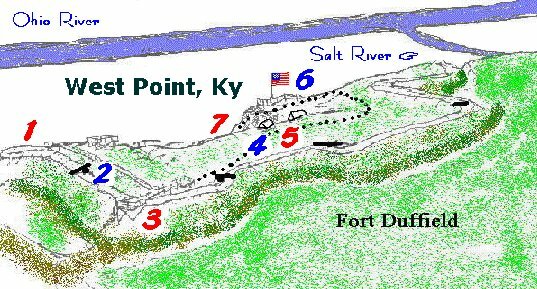 Click on the numbers to learn a little about that part of the fort. 3.Deck at Southwest Corner,looking east. 4.Center of South Wall,looking west. 5.Center of South Wall,looking north into the fort. 6.Lookout Point,looking north,overlooking West Point,Ky. 7.Spring,on hillside north of fort. Note: Clicking on each picture will take you to the next stop on the tour.